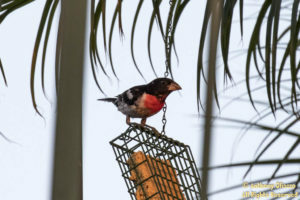 In the almost 5 years I’ve been record keeping bird sightings for the Barano Walk Trail here in Mission Viejo, California, this male Rose-breasted Grosbeak has to be in the top 5 coolest and rarest sightings that I am aware of along side the Zone-tailed Hawk sighting back in January of 2015. I know of a birder prior to 2011 that assured me of an American Redstart also being seen on this trail. 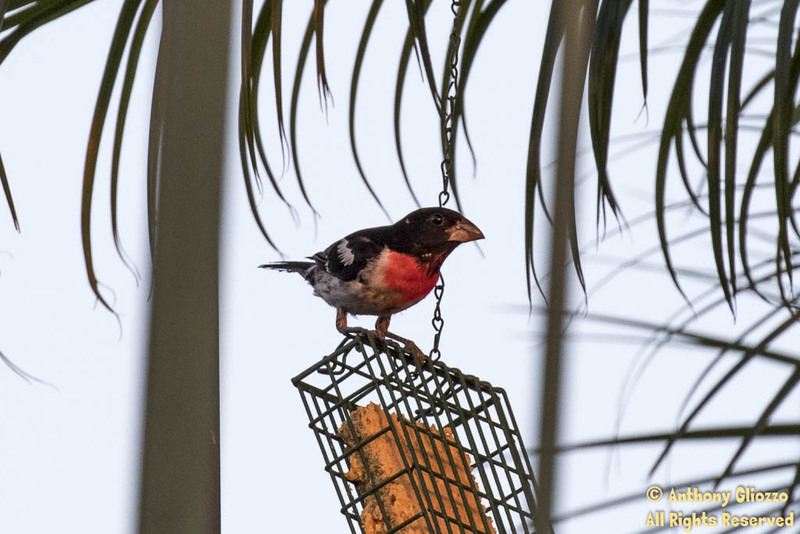 Originally back on July 17th, 2016 an initial sighting by Dorian Anderson was seen of this species on the suet feeder just below a street called Cenajo on the Barano Walk Trail. No photographic documentation was available. Upon this sighting, I had personally tried several times thereafter along with at least two other birders who joined without success, Mike Sanders and Ryan Winkleman except on July 25 for 10-12 seconds I had gotten a good view through binoculars but unfortunately I too had no camera gear at that time. At this point, it was becoming a moment of personal determination as summer continues on and the chances of the Rose-breasted Grosbeak vacating the area was more apparent. The good news however is the owner was replacing the suet feeder when it was emptied. This I believe was an important observation as identifying reliable food sources is paramount when bird tracking and relying on recurrences. I had arrived at this GPS: 33°38’28” N 117°39’15” W once again today, July 28th at approximately 6:40pm. It was unlikely a song would be heard however the typical call which is a high pitch “chink” sound was being heard nearby in the pepper trees. 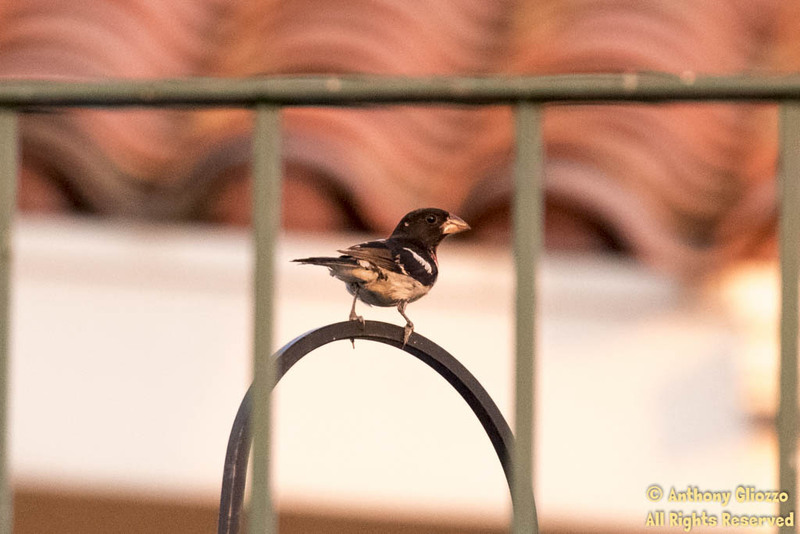 To add to the saga, as many as 4 Black-headed Grosbeaks were accounted for in this same vicinity recently. 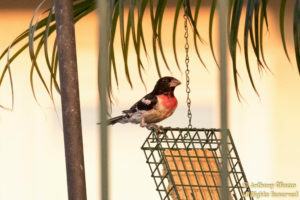 Their calls are almost identical as well as the songs to the Rose-breasted Grosbeak if unfamiliar. 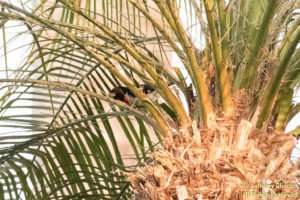 At approximately 7:37 pm from behind on the lower slope I noted a chunky bird fly up to one of the palm trees (photo below). 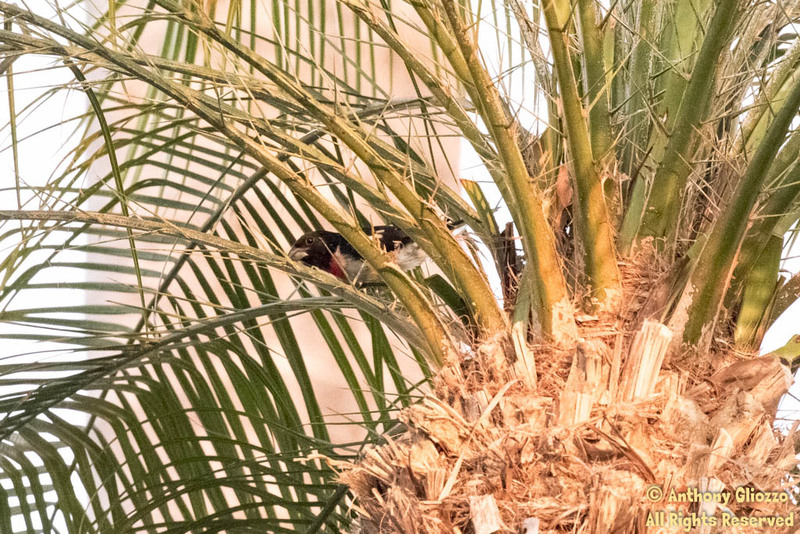 As it hid but peered out from one of the palms, I had enough of a glance for a positive ID. 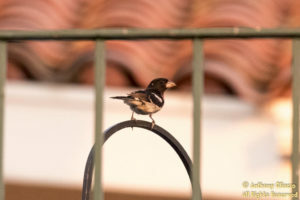 Eventually the grosbeak landed on the fence and then onto the feeder. The photographs below offer a few glimpses of my encounter and positive evidence of this sighting. 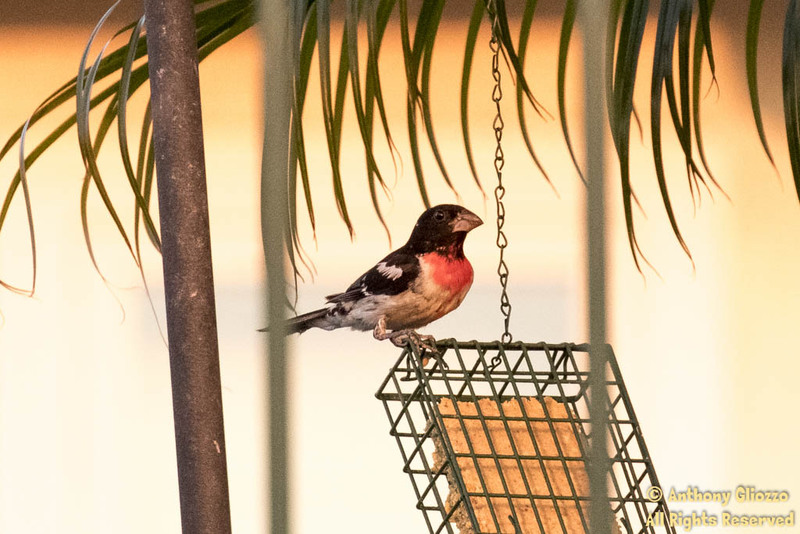 According to Doug Willick’s text message this evening (author of the book “Birds of Orange County”) he stated: “Having two apparent Rose-breasted Grosbeaks is pretty interesting (another was seen in Irvine about 3 weeks ago). During migration is of course the more typical time we see these. And almost every winter there’ll be one or two around. But summering birds are the rarest status for this species to occur in Orange County”.